Jesus had gay and lesbian followers. The fact of their following was obscured, however, by events and decisions very similar to things we experience today. The discomfort and irritation experienced by many religious people today regarding gay and lesbian believers is nothing new. Likewise, the conflicted conscience of some of these religious people caused by their ungodly actions against gays and lesbians is nothing new. On an individual level, where discomfort and irritation exist, attempts are made to rid oneself of the causes. And where embarrassment and shame exist, attempts are made to hide the facts that cause the embarrassment and shame, whether or not those facts should actually cause embarrassment and shame. On a social level, things are much the same, but different. Where small groups of people cause discomfort and irritation for the majority, measures are taken to rid themselves of the cause. Where embarrassment and shame result from these measures, “hiding the facts” takes the form of generating cover stories, planting misleading information, and the destruction of evidence. Today, we call this a “cover-up.” This series of posts, Ten Years in Galilee, is about what would today be called a crime, and the subsequent cover-up. One of my readers has already requested citations for the sources I use. I was already planning on providing them, but there may be times when I can’t track down a citation or an assertion. I will make every reasonable attempt to provide references, but there is one thing I need you to know. In these posts, I will only rely on mainstream scholarly opinion, and if I depart from commonly held positions, I will so acknowledge. For example, I assume the accuracy of the two-source hypothesis, and I assume that Q was a written source. It is not my purpose to engage in debates about the Q hypothesis, about whether or not it was a written source, etc. I may engage in some limited debate, but arguing about issues that have mainstream support is not my task. Note that I did not say overwhelming agreement–but when a scholarly opinion has a respectable supporter, I am generally willing to defer to people more learned than myself, generally, but not always. I deal with events that occurred some 2,000 years ago, spanning roughly ten years in Galilee. The story resembles a “cold case file” from television, but with a major difference. Instead of dealing with a solitary missing person report, we’re dealing with multiple missing persons, a missing community. You may be aware of the contemporary difficulties of investigating alleged atrocities, the destruction of villages, and of identifying the authors of organized genocide. Today there are usually survivors willing to testify, and NGOs prepared to investigate and take action. Even then, however, statements of denial are made, evidence is destroyed, and the guilty go free. Unfortunately, there was no one to speak for the devastated Q community. They were an embarrassment to everyone concerned. In the course of my investigation, I have several times been astonished that valuable evidence was laying in plain sight, right there on the passenger seat or the dashboard, as it were. I suspect that part of the problem is that when researchers are preoccupied with one investigation, they don’t notice evidence pertinent to another. In addition, when people are locked into a system, they are unlikely to recognize information that would call their system into question. When I began this research, my primary purpose was to investigate the major theme of Luke 17. I admit that when new and intriguing connections emerged, I was sometimes hesitant to pursue them, not wanting my research to expand beyond my comfortable academic territory. But as one “clue” led to another, I left my comfort zone and entered new territories, those of Q research and the Talmud. Fortunately good guides were available. When I started this investigation, I had no idea that it would lead me to discover what I believe is one of the seminal episodes of early church history. To introduce this journey into the past, part of my task is to provide you with a fairly clear picture of the Q source. So that everyone is “on the same page,” certain things need explanation. I want to discuss as briefly as possible what the Q source is about and what it probably looked like. Some of you are already familiar with the ideas surrounding Q, but for those who are not, here goes. There are four canonical gospels. Three of which have a lot in common–Matthew, Mark, and Luke–and these are called the synoptic gospels. (The fourth gospel, John, is markedly different from the first three, and is usually discussed in relative isolation from the others.) For most of church history scholars were content to follow the tradition of the early church father Augustine, who believed Matthew was written first, that Mark was an edited version of Matthew, and that Luke was an expansion of Mark. This ancient tradition left too many unanswered questions, and in the last two hundred years or so New Testament scholars have puzzled over the relationships between the synoptic gospels. There were too many loose ends for Augustine’s explanation to survive the critical scrutiny of some nineteenth century scholars. What Christian Hermann Weisse first proposed in 1838, which was echoed in 1863 by Heinrich Julius Holtzmann, is known as the two-source hypothesis. The German word for “source” is quelle, hence its abbreviation to “Q”. 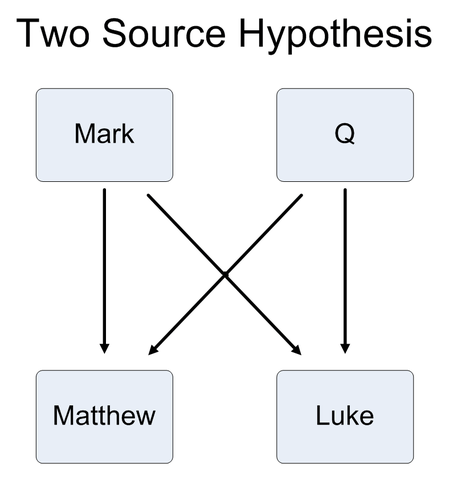 This hypothesis says that the gospel of Mark and the Q source were the two sources used by both Matthew and Luke in the composition of their gospels, with additional sources M and L, which account for the materials unique to Matthew and Luke respectively. In 1924, British scholar B.H. Streeter presented this comprehensive case for the two-source hypothesis, and the two-source hypothesis has grown in acceptance through the entire twentieth century. Q consists of the material common to Luke and Matthew, but not in Mark. Q accounts for roughly 25% of Luke and Matthew. The Q source consists of roughly one-half Jesus sayings and one-half more fully developed narratives. For NT critics there was one major barrier to the acceptance of the proposed Q source. The lack of any similar collection of Jesus sayings was a major hindrance to the popular acceptance of the Q hypothesis. This all changed in 1945 with the discovery of the Nag Hammadi library in Egypt. Among those documents was a copy of The Gospel of Thomas–a collection of Jesus sayings. This sayings source, together with the hypothesized Q source, demonstrated the existence of a previously unknown genre–collections of Jesus sayings. With the existence of the Q source on firmer footing, scholars felt secure enough to study Q itself, and discussed a variety of issues. Some of the main issues included 1) whether Q was an oral tradition or a written document; 2) the date and location of Q’s composition; 3) the social millieu of the Q community; 4) the theological and philosophical influences reflected in the Q source; 5) the layers of composition and the historical circumstances; 6) the eventual disappearance of the Q community; etc. The Q Source: Oral Tradition or Written Document? One contested issue is whether or not the Q source was an oral tradition or a written document. This question was bound to arise since there is no physical evidence of Q whatever. Such manuscript evidence would be a simple fragment that followed a reconstruction of the Q source, a fragment that did not include the unique additions of Matthew or of Luke, but simply reflected the language that Matthew and Luke shared in common. In light of the complete absence of such manuscript evidence, many New Testament scholars find it difficult to accept the written Q source hypothesis. Some scholars suggest that the Q gospel disappeared when it was incorporated into Luke and Matthew, to which others respond by asking why Mark did not likewise fall into disuse. Keith Fullerton Nickle mentions the theory that the disappearance of the Q source resulted from the agreed upon orthodoxy of Mark in contrast to the heterodoxy (heresy) of the Q community. (The Synoptic Gospels: An Introduction, p 94 WJKP, Louisville, KY) In a later post I will discuss the heterodox beliefs and practices of the Q community that resulted to its destruction. There is an argument for Q as a written text that I find quite persuasive. According to the Q hypothesis, Q consists of all the material common to Matthew and Luke, but which is missing from Mark. But even the material in common has slight differences in spelling, tense, etc., which would be expected whether the Q source was oral or written. What is more difficult to explain are those places in Q where the texts in both Matthew and Luke are identical. There are some at least eleven places where the Greek wording is repeated verbatim in both gospels. This verbatim agreement strongly suggests that the two gospel writers were working from texts that were either identical or virtually identical. They were free to massage the text to fit into their distinctive narratives in other passages, but this textual adaptation was often unnecessary. Thus, I proceed under the assumption that Q was a written source. The tangible form of the Q document has also been a subject of inquiry among scholars. Because the evidence indicates that Q was compiled and edited over a period of time, one increasingly popular belief is that the Q document was originally a kind of loose-leaf notebook, with a sheaf of papyrus pages held together in one corner by a cord. This loose-leaf notebook has the flexibility of allowing pages to be added as new material was generated for this earliest record of Jesus’ ministry. The idea of the loose-leaf notebook was put forward by Migaku Sato, and has been increasing in currency for some time. In a subsequent post this expandable format will help explain a vexing matter of gospel interpretation, as well as illustrate the catastrophic demise of the Q community. The loose-leaf notebook format, which allowed additional pages to be inserted into the document, was necessary and convenient for several reasons. First, assuming that some of the writing occurred simultaneously with Jesus’ ministry, the Jesus sayings could be added shortly after they were spoken. I must note that this idea is not popularly promoted–many Q scholars warn against the belief that we have the literal words of Jesus. I see no reason to doubt this possibility, however. I assume that much of Q was recorded by eye witness followers. Second, additional Jesus sayings from other witnesses could be easily appended to the existing Q pages, constituting the unsystematic expansions and accretions referred to below. Third, some sayings have not reached a final state of refinement, but have evidence of being organized into an outline form, a sort of rough draft. Finally, about half of the Q gospel has been polished and refined. The proposed loose-leaf notebook allowed for expansion with both rough and polished materials, and the shuffling of existing materials. Migaku Sato’s loose-leaf notebook idea has generated considerable comment, and many scholars accept it as a plausible description. Arland Jacobson wrote, “The loose-leaf notebook . . . would have facilitated just such literary growth as Sato describes.” (The First Gospel: An Introduction to Q, p. 58, Polebridge Press, 1992). In his discussion of Q, Benedict Thomas Viviano wrote, “It may also have been an ever- expanding collection, comparable to a loose-leaf folder, as Ulrich Luz and his student Migaku Sato think. (Trinity-Kingdom-Church: Essays in Biblical Theology, p. 56, Vandenhoeck & Ruprecht, 2001.) Dale Allison wonders aloud if the author of Q “was a literate teacher who drew up for his or her own use a document — a loose- leaf notebook such as Sato envisions? (The Jesus Tradition in Q. 1977, p. 31). 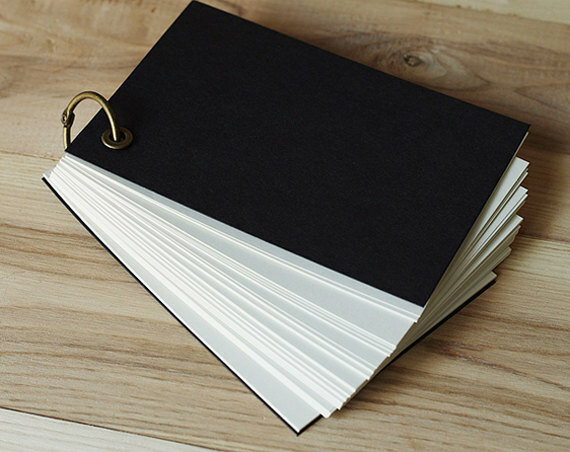 A modern example of Migaku Sato’s loose-leaf notebook. By “unmotivated” Kloppenborg means there is no dramatic or narrative reason for the location of many of the sayings in Q–there is no context except the “And-Jesus-taught-them-saying” sort of thing. By “unsystematic” he seems to mean that many of the Jesus sayings grouped together have no apparent organization or theme. 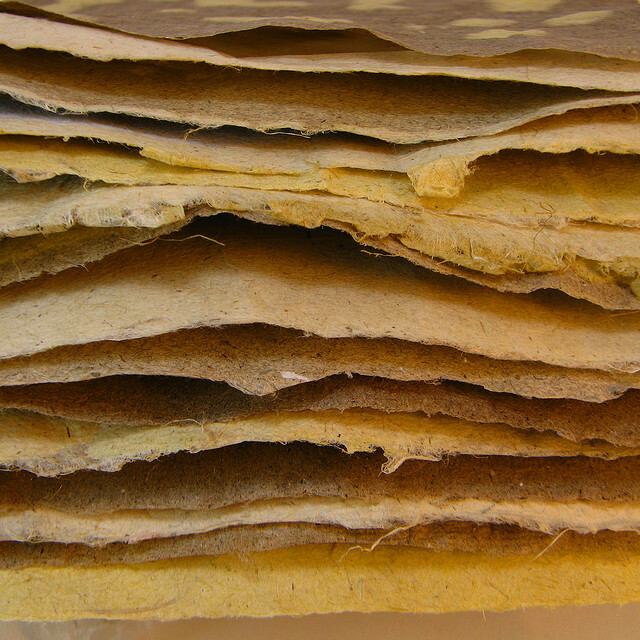 An unbound stack of writing sheets would have been impractical 1) for ongoing composition or 2) for use in teaching. Q is accepted by many scholars to be closer to the actual events of Jesus’ ministry than any other sources we have. If the writer(s) and editor(s) of Q actually heard Jesus’ words (which I believe many did), then the fact that his memorable statements were initially recorded with relatively little embellishment, not being crafted and incorporated into smoothly flowing narratives, is completely reasonable. One collection of disjointed sayings is Luke 17: 1-10, where there are several clear thoughts but no connective tissue. The writer was apparently loathe to omit something Jesus had said, and preserved everything, even without recording the context. Given enough time and the proper circumstances, the material would have been developed more adequately. There are places where sayings are connected only by catchwords, having some word in common. In one perennially troubling catchword collection there is actually evidence of “rough notes” for a future narrative, the implications of which I will discuss in a later post. 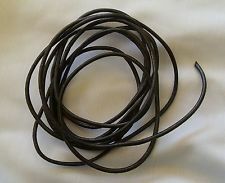 Instead of a metal loose-leaf ring, Q was likely bound with hemp or leather. “That half of a document is the result of controlled editorial activity and half is the result of unsystematic accretion is, of course possible, but surely not a happy scenario…. While Sato offers evidence of the existence of notebooks, he provides no evidence that literary works were ever produced using a ‘loose leaf’ model” (Kloppenborg, Excavating Q, p. 139, Fortress Press, 2000). We need to note that Kloppenborg has his own fully developed theory of Q’s composition history, of the several stages of its growth and expansion, and that Migaku Sato has developed his own composition history. Kloppenborg’s remarks about no evidence existing for the writing of literary works in a loose-leaf notebook seems petty to me, especially given the fact that many of the world’s great ideas were first sketched out on napkins, most of which have failed to survive. The notebooks of famous writers reflect the same rough disorganization that we see in some sections of Q. The disorganized notes of Finnegan’s Wake may resemble original Q drafts. Key information regarding the destruction of the Q community is preserved in Gospel of Q, information regarding the location of the Q community, as well as the motives behind its destruction. The Q community’s location is important because with that knowledge we discover who was literally at the scene of the crime, someone who had the means, motive, and opportunity to mount the campaign against the gay and lesbian followers of Jesus. But that comes later. * Other scholars include Dale Allison, William Arnal, Kyu Sam Han, Richard Horsely, Jonathan Draper, Arland Jacobson, and Amy-Jill Levine. This entry was posted in Q Source, Synoptic Gospels, Ten Years in Galilee and tagged Jesus sayings, John S. Kloppenborg, Migaku Sato, Q Source. Bookmark the permalink. Very tantalizing start. Been doing some reading on Q and Secret Mark. Had not yet discovered there might be some ties. Ready for the next installment!! For what little it’s worth, I am in complete agreement with your approach. Thanks, Donald. It’s good to know that my basic approach is plausible to you, and not ridiculous from the outset!